To submit an event, please email: budw@ride-ct.com. 7 – Spring Motorcycle Swap Meet at Stafford Motor Speedway in Stafford Springs, CT.
12-14 – April Motorcycle Mayhem presented by Catskill Mountain Thunder in East Durham, NY. 20 – Ride1 Rally at Lime Rock Park racetrack in Lakeville, CT from 11 a.m. until 6 p.m. and presented by Spectro Performance Oils. 26-27 – AMCA Perkiomen Chapter National Meet – antique motorcycle show and swap meet in Oley, PA.
27 – AMA Monster Energy Supercross at 4:30 p.m. at MetLife Stadium in East Rutherford, NJ. 5 – The 36th annual May Day Breakout Party by the Connecticut Motorcycle Riders Association from noon to 5 p.m. at the Wolcott VFW in Wolcott, CT.
5 – The 45th annual Keene Bike Swap Meet in Keene, NH – 9 a.m. to 5 p.m. at Cheshire Fairgrounds in Swanzey, NH. 5 – Motorcycle Hillclimb staged by the Quaboag Riders Motorcycle Club at 11 a.m. on May 5, 2019 in Monson, MA. 11 – Wild Rabbit Community Moto Show from 5 to 10:30 p.m. at 297 Mass. Ave. in Cambridge, MA. 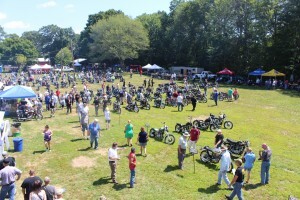 16 – Motorcycle Madness in Newington, CT. From 4:30 to 9:30 p.m. at Mill Pond Park. 16-19 – Concours Owners Group Northeast Spring Fling in Matamoras, PA.
19 – Blessing of the Motorcycles at Lourdes Shrine in Litchfield, CT.
19 – The 31st annual Stateline Motorcycle Swap Meet from 8 a.m. to 4 p.m. at the Rochester Fairgrounds in Rochester, NH. 26 – British Motorcycle Show and Swap Meet presented by British Iron Association of Massachusetts in Oxford, MA. 31-June 2 – Rockstock at New England Motorcycle Museum in Rockville, VT.
31-June 2 – Bennington Triumph Bash in Bennington, VT.
2 – British Motorcycle Meet staged by BSA Owners Club of New England in Lancaster, MA. 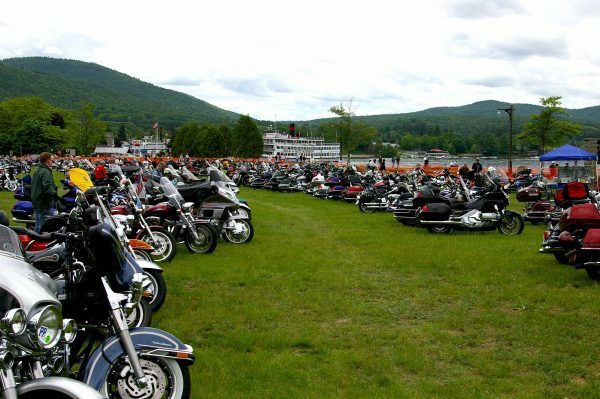 4-8 – Americade in Lake George, NY. 8-9 – Motorcyclepedia Expo from 9 a.m. until 5 p.m. at Motorcyclepedia Museum in Newburgh, NY. 8-16 – Laconia Motorcycle Week Rally in Laconia, NH. 9 – New England Spring Fling for Moto Guzzi owners at Sweet Evalina’s Stand from 10 a.m. to 2 p.m. in Woodstock, CT.
20-23 – The 42nd annual Jampot Vintage Motorcycle Rallye at Blackthorne Resort in East Durham, NY. 21-23 – Thousand Islands River Run Rally in Alexandria Bay, NY. TBA – Thompson Vintage Motorcycle Classic at Thompson Speedway Motorsports Park in Thompson, CT.
June 28-30 – Thunderdome at New England Motorcycle Museum in Rockville. 5-7 – Empire Chapter National Meet of the Antique Motorcycle Club of America in Trumansburg, NY. 7 – Summer Motorcycle Swap Meet at Stafford Motor Speedway in Stafford Springs, CT.
13 – Hard Times Chopper Show at noon at Ralph’s Rock Diner in Worcester, MA. 14 – Falls Village Car & Motorcycle Show from 10 a.m. to 3 p.m. in Falls Village, CT.
18-20 –Iron Adventure of New England HOG Rally at the Jackson Gore Inn at Okemo in Ludlow, VT.
22-26 – Concours Owners Group National Rally in Williamsport, PA.
On hiatus until 2020 – Hendee Day & Vintage Motorcycle Rally at Hilltop Farm in Suffield, CT.
28 – The 10th annual Indian Motorcycle Day at the Lyman and Merrie Wood Museum of Springfield History in Springfield, MA., which is not far from the site where the original Indians were built. It’s a great two-fer event – a show outside and the museum display that traces Indian’s history inside. 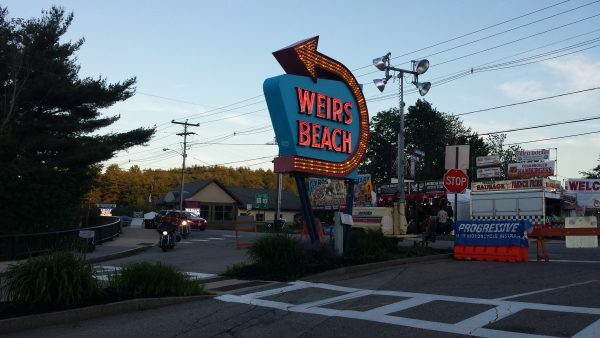 Hours are from 9 a.m. to 3 p.m.
21 – Doc’s 6th Annual Vintage & Classic Bike Show at Doc’s Motorcycle Parts in Waterbury, CT.
25-28 – The annual Northeast European Motorcycle Rally at the Jordon Grand Hotel at Sunday River in Newry, ME. 2-3 – Yankee Chapter of the Antique Motorcycle Club of America National Meet at the Terryville Fairgrounds in Terryville. 2-4 – The 23rd annual Damn Yankees Rally at the Heath Fairground in Heath, MA, staged by Yankee Beemers. Canceled – Middletown Motorcycle Mania in Middletown, CT.
15 – The 5th annual Killingly Bike Night in Killingly, CT from 5 to 9 p.m.
18 – Brit Jam hosted by the British Iron Association of Connecticut, the 33rd annual Brit Jam meet will be held at the Haddam Neck Fairgrounds in East Haddam, CT.
18 – The annual Splittin’ Lanes & Dodgin’ Gutters classic motorcycle show from noon to 6 p.m. at the Brooklyn Bowl, 61 Wythe Ave. in Brooklyn, NY. 23-25 – Murdercycles Cafe Fever at New England Motorcycle Museum in Rockville, CT.
31 – Sept. 1 – Owls Head Transportation Museum Vintage Motorcycle Meet in Owls Head, ME. TBA – Brooklyn Invitational at the Root Studios, 131 North 14th St., Brooklyn, NY from 1 to 11 p.m.
8 – Rice-O-Rama, the all-Japanese meet from 8 a.m. to 5 p.m. at the Spencer Fairgrounds, 48 Smithville Rd. in Spencer, MA. 11-15 – Catskill Mountain Thunder Motorcycle Festival in East Durham, NY. 15 – The 36th annual IMOC Rally hosted by the Italian Motorcycle Owners Club at the Hamilton Rod & Gun Club in Sturbridge, MA. Laverda as the featured marque. 15 – Doc’s 50th anniversary Customer Appreciation Day and Bike Show at Doc’s Motorcycle Parts in Waterbury, CT.
19-22 – Concours Owners Group Fall Rally in Alexandria Bay, NY. 27 – Auction at New England Motorcycle Museum in Rockville, CT.
29 – The annual classic European Motorcycle Day from 8 a.m. to 2 p.m. at the Larz Anderson Auto Museum in Brookline, MA. 15 – The 39th annual Antique Motorcycle Show from 11 a.m. to 4 p.m. at the Queens County Farm Museum in Floral Park, NY. TBA – Autumn Swap Meet in Keene, NH – 9 a.m. to 5 p.m. at Cheshire Fairgrounds. 10 – The 23rd annual Moto Guzzi New England Day from 10 .m. to 2 p.m. at the Vanilla Bean in Pomfret, CT.
27 – Fall Motorcycle Swap Meet at Stafford Motor Speedway in Stafford Springs, CT.
19 – Crotona Midnight Run from 10:30 p.m. to 6 a.m. Jan. 20 in Nanuet, NY, hosted by Ramapo Motorcycle Club. 19 – NER Annual Holiday Party in West Boylston, MA from 5 to 9 p.m.
19 – MotoJam Snow Hill Climb at Holiday Mountain in Monticello, NY. Registration begins at 9 a.m. Snow drags start at 1 p.m.
19-20 –Springfield Motorcycle Show at Eastern States Exposition in West Springfield, MA. 10 a.m. to 7 p.m. on Saturday and 10 a.m. to 5 p.m. on Sunday. 19 – Ural National Demo Day – Ural of New England in Boxborough, MA and North Hampton, NH. 9-10 – Northeast Motorcycle Show from 10 a.m. to 5 p.m. at Shriners Auditorium, 99 Fordham Rd., Wilmington, MA. Americade – What began as a gathering of Gold Wing riders has evolved into a huge blowout with countless vendors and demo rides from manufacturers. It will be held in Lake George, NY from June 4-8, 2019. April Motorcycle Mayhem – Presented by Catskill Mountain Thunder from April 12-14, 2019 in East Durham, NY. Barber Vintage Festival – The 15th annual event Oct. 4-6, 2019 at Barber Vintage Motorsports Museum in Birmingham, Al. Bennington Triumph Bash – The ninth annual Bennington Triumph Bash, a rally for owners of Triumph motorcycles. May 31-June 2, 2019 in Bennington VT. Blessing of the Motorcycles at Lourdes in Litchfield – An annual affair at the shrine in Litchfield, CT. May 19, 2019 at 1:30 p.m.
British Motorcycle Meet – The 41st annual meet staged by the BSA Owners Club of New England at the Bolton Fair fairgrounds in Lancaster, MA on June 2, 2019. British Motorcycle Show and Swap Meet – Hosted by the British Iron Association of Massachusetts, this meet will be held for 28th time at the Singletary Rod & Gun Club in Oxford, MA on May 26, 2019. Brit Jam – Hosted by the British Iron Association of Connecticut, the 33rd annual Brit Jam meet will be held at the Haddam Neck Fairgrounds in East Haddam, CT on Aug. 18, 2019. Catskill Mountain Thunder – Sept. 11-15, 2019 in East Durham, NY. Charity Challenge Poker Run and Music Fest – Sept. 16, 2018 in Tamarack Lodge in Voluntown, CT.
Crotona Midnight Run – The 100th annual Crotona Midnight Run. Midnight was held in January in Congers, NY. Damn Yankees Rally – Aug. 2-4, 2019. The 23nd Damn Yankees Rally at the Heath Fairground in Heath, MA., staged by Yankee Beemers. Doc’s 6th Annual Vintage & Classic Bike Show – July 21, 2019 at Doc’s Motorcycle Parts in Waterbury, CT.
Doc’s Customer Appreciation Day & Bike Show – Sept. 15, 2019 at Doc’s Motorcycle Parts in Waterbury, CT.
European Motorcycle Day – The annual classic European Motorcycle Day from 8 a.m. to 2 p.m. at the Larz Anderson Auto Museum on Sept. 29, 2019 in Brookline, MA. Falls Village Car & Motorcycle Show – July 14, 2019 from 10 a.m. to 3 p.m. in downtown Falls Village, CT.
Hard Times Chopper Show – July 13, 2019 at noon at Ralph’s Rock Diner in Worcester, MA. Hendee Day & Vintage Motorcycle Rally – at Hilltop Farm in Suffield, CT. On hiatus until 2020. 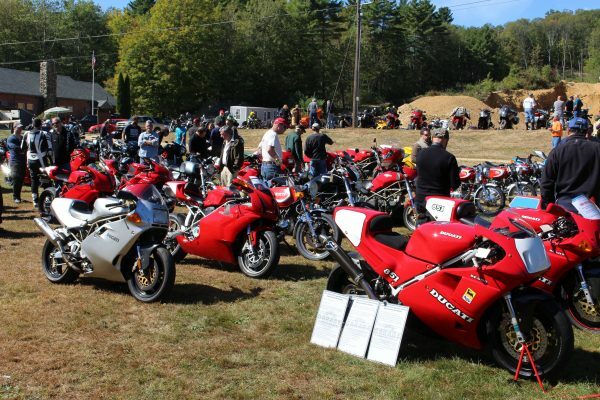 IMOC rally – Hosted by the Italian Motorcycle Owners Club, the 36th IMOC rally is at the Hamilton Rod & Gun Club in Sturbridge, MA on Sept. 15, 2019. Indian Motorcycle Day at the Lyman and Merrie Wood Museum of Springfield History in Springfield, MA., which is not far from the site where the original Indians were built. It’s a great two-fer event – a show outside and the museum display that traces Indian’s history inside. July 28, 2019 from 9 a.m. to 3 p.m.
Iron Adventure of New England HOG Rally – July 18-20, 2019 at the Jackson Gore Inn at Okemo in Ludlow, VT.
Killingly Bike Night – 5th annual bike night in downtown Killingly, CT. Aug. 15, 2019 from 5 to 8:30 p.m.
Laconia Motorcycle Week Rally – What happens in Laconia stays in Laconia. The event celebrates its 95th year in Laconia, NH from June 8-16, 2019. May Day Breakout Party – The 36th annual affair held by the Connecticut Motorcycle Riders Association. Set for noon to 5 p.m. on May 5, 2019 at the Wolcott VFW, Route 69, in Wolcott, CT.
Middletown Motorcycle Mania – Canceled. Moto Guzzi New England Day – The 23nd annual event from 10 a.m. to 2 p.m. on Oct. 20, 2019 at the Vanilla Bean in Pomfret, CT.
Motorcycle Hill Climb – Staged by Quaboag Riders Motorcycle Club in Monson, MA on May 5, 2019. Motorcycle Madness – The Newington (CT) Parks and Recreation Department holds this event from 5:30 to 9:30 p.m. on May 16, 2019 at Mill Pond Park. Motorcycle Swap Meet(s) – April 7, July 7 and October 27, 2019 at Stafford Motor Speedway in Stafford Springs, CT.
Keene Bike Swap Meet – May 5, 2019 at Cheshire Fairgrounds in Swanzey, NH. 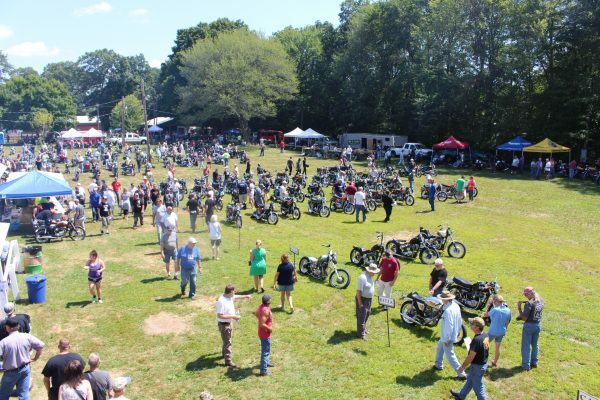 New England Motorcycle Museum – Various events throughout 2019 in Rockville, CT. Auctions on May 25 and September 27, 2019. Rockstock from May 31-June2, Thunderdome fromJUne 28-30, and Mudercycles Cafe Fever from Aug. 22-25. New England Spring Fling – New event for Moto Guzzi owners. 10 a.m. to 2 p.m. on June 9, 2019 at Sweet Evalina’s in Woodstock, CT.
Northeast European Motorcycle Rally – The 20th annual rally July 25-28, 2019 at the Jordan Grand Hotel in Newry, ME. Owls Head Transportation Museum Vintage Motorcycle Meet – Aug. 31-Sept. 1, 2019 in Owls Head, ME. Queens County Farm Museum – The 39th annual Antique Motorcycle Show in Floral Park, NY. Sunday, Sept. 15, 2019 from 11 a.m. to 4 p.m.
Rice-O-Rama – All-Japanese meet at the Spencer Fairgrounds in Spencer, MA. on Sept. 8, 2019. Ride1 Rally – Motorcycle rally at Lime Rock Park racetrack in Lakeville, CT on April 20, 2019 from 11 a.m. to 6 p.m. and presented by Spectro Performance Oils. Split’n Lanes & Dodgin’ Gutters – A classic motorcycle show at the Brooklyn Bowl, 61 Wythe Ave. in Brooklyn from noon to 6 p.m. on Aug. 18, 2019. Springfield Motorcycle Show – Eastern States Exposition in West Springfield, MA. Jan. 19-20, 2019. Stateline Motorcycle Swap Meet – The 31st annual meet from 8 a.m. to 4 p.m. on May 19, 2019 at the Rochester Fairgrounds in Rochester, NH. Thompson Vintage Motorcycle Classic – The 4th annual event at Thompson Speedway Motorsports Park in Thompson, CT on TBA. Thousand Islands River Run Rally – The 13th annual rally June 21-23, 2019 on Alexandria Bay, NY. V-Twin Expo – from 9 a.m. to 5 p.m. June 8 and 9, 2019 at Motorcyclepedia Museum in Newburgh, NY. Wild Rabbit Community Moto Show in Cambridge, MA on May 11, 2019 from 5 to 10:30 p.m. at 297 Mass. Ave in Cambridge, MA. Yankee Chapter of the AMCA (Yankee Chapter) National Meet – Annual meet sponsored by the Yankee Chapter, Antique Motorcycle Club of America. It will be held at a new location: the Terryville Fairgrounds in Terryville, CT on Aug. 2-3, 2019.